In 2016, there were 154,190 back injuries reported across all industries. These back injuries are due to bad posture and repetitive motion — back-breaking labor. But it doesn’t have to be this way. Enter Leo Ochoa. 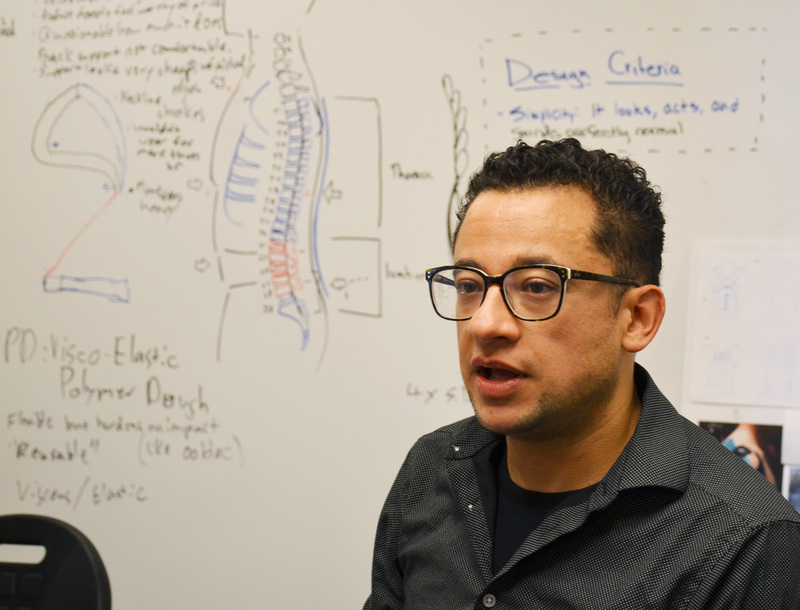 Leo Ochoa is on a mission to free the world of back pain. 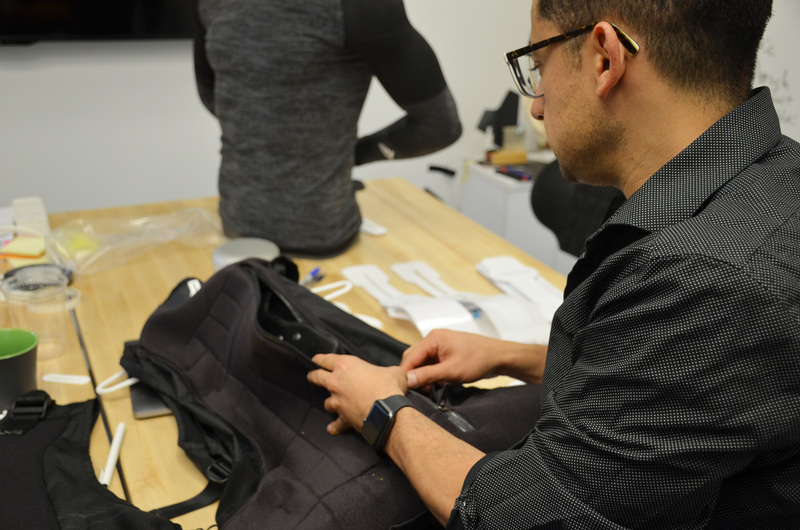 Leo is the designer and owner of Dorsum, a start up company in Portland Oregon in the process of creating purposeful and dependable products that improve the life of the American workforce by protecting them from injury. He and his 5 team members, based out of PIE Shop (Portland Incubator Experiment), are ready to launch a new product this fall, via Kickstarter. This new product is designed to support the spine, improve posture, and promote core health to reduce the likelihood of injury for anyone who carries, twists or reaches to do their job. Growing up in Hood River along the Columbia River Gorge inspired me to become a wild land firefighter by staying connected to the outdoors and protecting the land. It started in the summer before going off to the University of Oregon, and being a part of a group building and restoring hiking trails. The group was funded by the United States Department of Agriculture Forest Service, where I learned the importance of cleaning the land and restoring the environment. I got hooked! At the time as a university student I kept coming back through a college program, this time as a park ranger assisting the public. Working alongside the trail crew and Gorge Fire crew I was inspired to do more and signed up to become a wild land firefighter assisting in large fires. I served for three summers being sent out to fires in Oregon and at times stationed at the base of Mt. Hood chasing lightning strikes on a lightning strike crew. I love imagining new possibilities and dreaming about what the future can be. I get excited exploring ideas and creating new and better ways making things. Using design to help solve problems and improving the lives of others brings joy to what we do. The challenge is in creating those new possibilities for better products. To create a new product we have envisioned means we go out and find the resources necessary to build it. At times it means combining new materials from different industries, or helping our partners create a new process together. With innovation you find new challenges at every step of the way that force you to adapt and learn quickly. Recently we have been surprised at some materials we’ve had to custom engineer to fit our functional needs, at first thinking they would be easily available. How has the first year of business been like? The first year has been tough but very rewarding. I knew starting a business would be difficult, and creating a new product challenging, but starting with a product integrating new components has added to the difficulty. From the beginning the experience has been layers of challenges. So many things have to align before you start to see progress. For the industrial design and hardware we had to find a manufacturer with the advanced composites expertise willing to try and experiment with us. 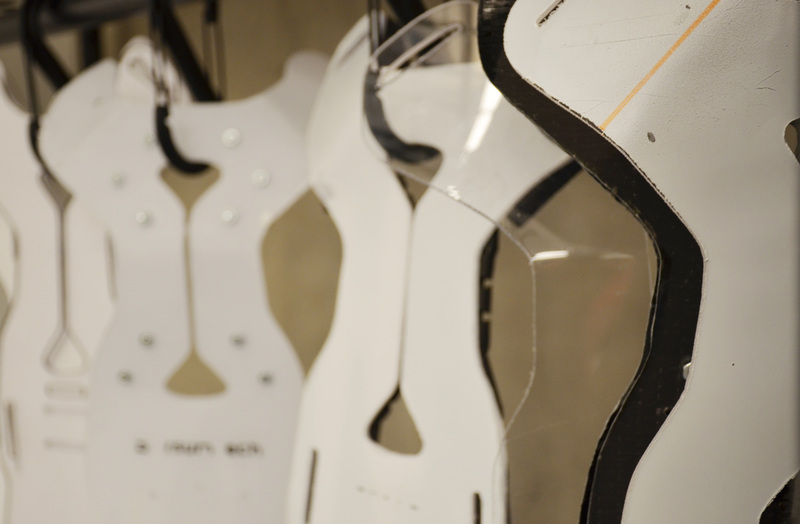 For the soft goods, we had to then find an apparel studio that understood the entire product creation process from concept to completion and flexible enough to accommodate for new information coming in between prototype rounds. Luckily we found a great apparel studio we are now working with. Access to a biomechanics lab willing to work with a small company is limited in this area. And finding participants patient enough to wait for prototypes to be made before they fully knew what we were creating was difficult. You slowly learn that some resources will filter themselves out, and the ones that stick around make a great long lasting fit. Once we received the first machined sample we noticed a huge leap in our development progress. When others saw what we were creating their excitement spiked asking when they could test one. Our manufacturing partners have also now gone through a complete prototype cycle with us and are sharing ideas how they can improve the process. Getting past the handmade, sewn proof of concept prototype to a machined sample was a huge milestone and success highlight for us! Our vision is to be the innovative leaders of back support and spinal postural alignment. To redefine this category and introduce solutions our customers can start using to build healthier lives. Within the two years, deliver 2-3 new products our users can love while partnering with the right Portland based company to custom design for them. We are actively researching industries where back pain is a growing issue due to the increase of repetitive motion. Within 10 years finding the right large scale company to co-create advanced products that can reduce risk of back injury and have a huge effect to improve the health of the industry. Starting local and working towards improving the health of the community at large. Revant Optics is a company I find interesting and very inspiring for many reasons. Their approach in taking on a big industry and reshaping the business model from the ground up is intriguing. 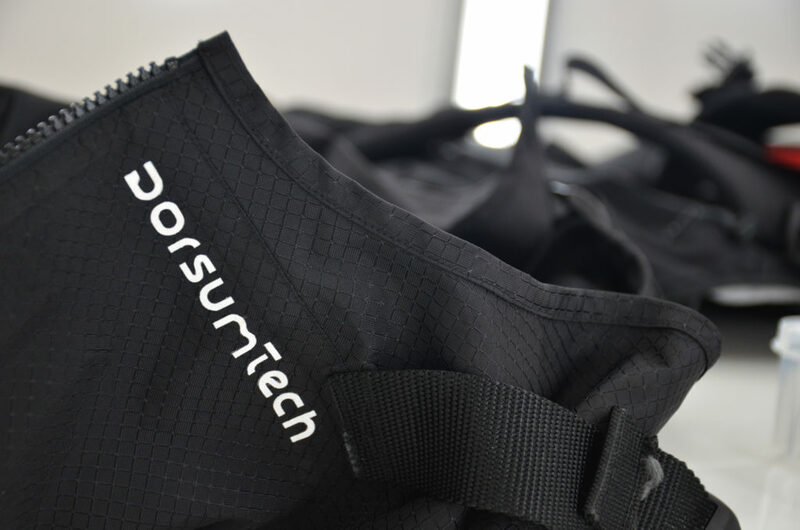 Their interchangeable lenses with high testing and safety standards make for great products that can be work tool or recreational device is one I find many parallels to Dorsum with the interchangeable flexible back support. Their recent successful Kickstarter campaign is motivational since we are also considering this avenue for our product launch. I’ve sat down with Sue Bal to discuss the opportunities coming up for this year. I’m excited for the Peer-to-Peer program and to learn from mentors and other entrepreneurs. I recently attended the Outdoor Industry happy hour where I met a lot of great passionate members. What do you find challenging/rewarding of having a company based or producing products in Portland? It is rewarding to produce products in Portland because we get to connect with local companies doing amazing work. Portland is the perfect location for us; we get to learn from the outdoor athletic brands innovating in high performance materials that apply to what we make. Companies working with advanced composites are also nearby. Being close to the outdoors means we get to take our products outside to wear test in different environments. The challenge is having to go out to multiple locations to meet vendors and collect materials during our research & development phase. Luckily Portland is the right size where by moving around you can easily cover a lot each day. How do you feel Portland influences your company? Shapes your products? We have had great response from Portland as far as getting feedback and learning from what others share. Portland has a collaborative culture where people are excited about what they make and are happy to show what they are working on. The rapid change of weather always keeps us thinking about designing our apparel for multiple climates and outdoor conditions. The changing environment allows us to better understand layering of fabrics to create versatile applications. Creating better products means you look at the problem and solution from different angles, so we build a team with diverse ideas, skills, and backgrounds, and connecting with the community has been very important for us. This is shaping our product more now as we prepare to run pilots with a few local companies. What advice would you give someone looking to start their own company or product line? Go for it! The hardest part is getting started. Along the way you find the right people and resources that will help you get to your next step. You refine and improve along the way, just be open minded that the solutions you find will be different than what you had envisioned. Sometimes the answer comes from the most unexpected locations, so be flexible to learning and exploring. Define your values and what is important to you early on, this will help guide and filter the decisions you make with your product and company. What advice would you give a fellow entrepreneur? Learn from your product and company as much as you can. How your product develops and the people you bring in shape you just as much as you shape them. Invest in improving the quality of your team because that will elevate the quality of your product. Realize as early as possible that you can’t do everything yourself, and the success of the product depends on the team working and collaborating together. Always be improving on communicating your ideas clearly, and developing trust within the team so you can hand off parts of the work to focus on new challenges. And lastly, get comfortable with constant change. Challenges arrive suddenly, but you get better at solving them as a team. Portland A&O powered by Prosper Portland aims to support the success of Oregon’s 800+ Athletic and Outdoor firms through community, peer-to-peer learning, events, and programming. Portland A&O Community monthly features are our way to highlight the different stages of entrepreneurship, innovation and breath within Oregon’s impressive A&O industry. By sharing stories, advice and experiences, we can continue to support the industry and the people who make it thrive. If you have a product, company or personal story to be featured, share with us!